HomeBlogWhat to look for if you plan to do a Smile Makeover? 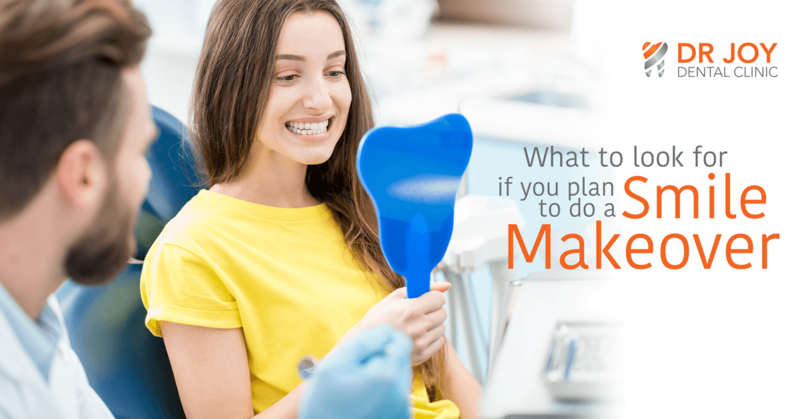 What to look for if you plan to do a Smile Makeover? Having a beautiful smile can now be easily obtained by anyone provided you make the right choices. Even people with good dental hygiene and structurally sound teeth can be dissatisfied with certain elements of their smiles. Discoloration, misshapen teeth and minor orthodontic issues can affect a person’s appearance and self-confidence. People who are self-conscious about the appearance of their teeth and gums often are hesitant to smile and in severe cases can even affect their social life. Modern dentistry can now offer ideal solutions for these people in the form of fully customized smile makeover treatments. Every person who is dissatisfied with their smile is a candidate for cosmetic dentistry. Good oral health is a pre-requisite before starting cosmetic dental procedures. Choosing the right dentist is perhaps the most important step you can take towards ensuring the best possible aesthetic results. Not all dentists are trained to deliver high quality cosmetic dental treatments. Our team of Cosmetic Dentist in Dubai is highly experienced and European Certified having a portfolio of treating many patients. Final results are highly dependent on the skill set of technicians. With our own dental laboratory, we deliver best smiles so that they can meet your personal expectations and are specially customized for you. Porcelain veneers can have dramatic results, and they can truly transform your appearance. Therefore, they are one of the most popular treatments to include in a smile makeover. Teeth whitening – Various teeth whitening options are available at our clinics. Zoom Whitening is the most commonly used whitening technique that lightens teeth up to eight shades in just one quick visit. Dental crowns – These tooth-shaped prosthetics can cover worn or misshapen teeth. Invisalign® – Straightening your teeth with the use of clear invisible braces. Dental bonding – Tooth-colored resin can be used to conceal chips, cracks, and minor spacing issues. Gum reshaping – Excess gum tissue can be removed to give you a healthier-looking smile. Next post: What is Gum Disease?